FIFA [ Images ] president Sepp Blatter [ Images ] admitted that he was let down by the behaviour of the players in Sunday's World Cup final between Netherlands and Spain. "The final was not exactly what FIFA, and what myself, had expected, in terms of fair play," he said. "The refereeing trio had a really hard task on the field and I can say they were not helped in this task," he added. Blatter declined to comment on the much-criticised performance of English referee Howard Webb [ Images ] but reiterated his view that controversy was one of the game's attractions. 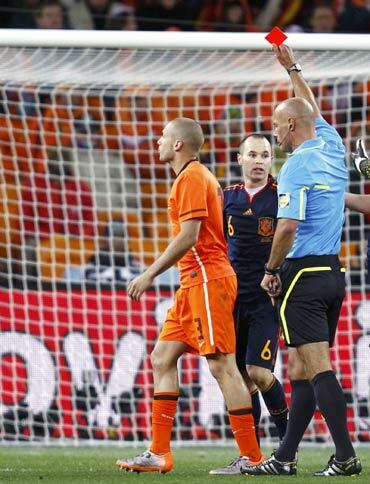 Webb showed 13 yellow cards in a bruising encounter - a record for the final - and sent off Dutch defender John Heitinga [ Images ] in extra time. "This is the human aspect of our game," Blatter said. "If our game was perfect, if our game was scientific, if our game was controlled only by technology, by science, there would be no more discussion. "This is football. We have to live with the errors, the errors of the players and the errors of the referees. I don't think perfection exists," he added. Blatter denied he had been booed by the crowd at Soccer City stadium when he went onto the pitch before Sunday's match, which Spain won 1-0. "The only thing I was aware of was that there were less vuvuzelas," he said. "I don't know about this. In this country and everywhere I have been, I have always been received as a friend, as an African. "Yesterday, it was the same, we went on the field of play and I can say it was a great moment," he added.